Born in Comox, British Columbia June 6, 1965, Cam Neely forged the prototype for power forwards during his abbreviated thirteen-season NHL career. 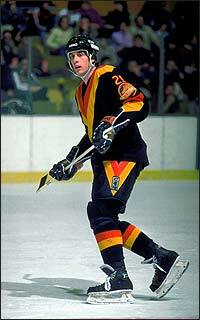 Neely debuted with the Canucks in 1983 and played three seasons in Vancouver. 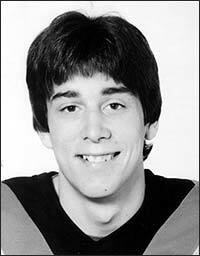 As a rookie with the Portland Winter Hawks of the Western Hockey League, Neely scored 56 goals and 120 points in 1982-83. That spring, with Portland entered as the host team, the Winter Hawks collected the Memorial Cup as junior champions. Cam recorded a hat-trick, including the winning goal, in the tournament's championship game. After a sensational junior career, Cam was selected by the Vancouver Canucks ninth overall in the 1983 NHL Entry Draft. He made his NHL debut that fall and played three seasons in Vancouver. In his second season as a Canuck, Cam exhibited the promise expected of him when he scored twenty-one times. But his career found a new gear when he got the opportunity to play for the Boston Bruins after a June 1986 trade sent Neely and Vancouver's first round draft pick in 1987 to Boston for Barry Pederson. Increased ice time allowed the 6'1", 215 pound winger to explode offensively. In 1986-87, he tallied 36 times, followed by seasons with 42, 37, 55 and 51 goals. Injuries reduced Cam's season to just nine games in 1991-92 and 13 the next season. Returning to play in 1993-94 after the two injury-riddled seasons, Neely proved that he hadn't lost his ability to score, collecting 50 goal in just 49 games (third fastest in NHL history) and earning Cam the Masterton Trophy for perseverance and dedication. In spite of nagging injuries, in the ten seasons Neely played for the Bruins, he still led the team in scoring seven times, including three campaigns with fifty or more goals. After being acquired by the Bruins in 1986, Neely spent ten seasons with Boston, leading his team in scoring seven times. He scored 50 or more goals in three of those seasons. Considered one of the dominant forwards of his era, Cam used his size and strength to characterize his game. Physical play took its toll, though, reducing Neely to just 9 games in 1991-92 and to 13 in 1992-93. In both 1987-88 and 1989-90, the Neely-led Bruins reached the Stanley Cup final, facing the powerful Edmonton Oilers on both occasions. "Getting to the Stanley Cup finals twice with the Bruins was quite a highlight but on the other hand, it was also disappointing to get that far and not win the championship," Cam recalled. 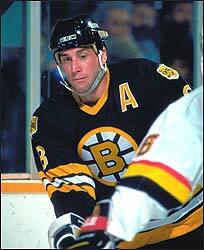 Cam Neely was selected to the NHL All-Star Team four times (1988, 1990, 1991 and 1994). 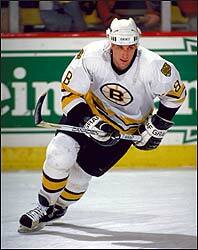 Following his retirement, the Boston Bruins retired Cam's Number 8 in an on-ice ceremony January 12, 2004. 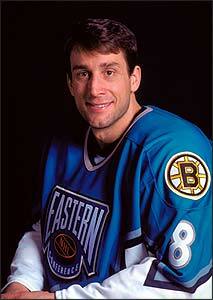 Injuries finally took their toll and Cam Neely announced his retirement on September 5, 1996 at the age of 31. Through 726 regular season games, Cam Neely collected 694 points  395 goals and 299 assists  and was selected to the NHL's Second All-Star Team in 1988, 1990, 1991 and 1994. Cam also recorded 57 goals and 32 assists for 89 points in 93 playoff contests and is the Boston Bruins' all-time leading goal scorer with 55 tallies. The Boston Bruins honoured Cam on January 12, 2004 by retiring his number 8. That honour put Neely in some very elite company. Other Bruins so honoured are Eddie Shore (#2), Lionel Hitchman (#3), Bobby Orr (#4), Dit Clapper (#5), Phil Esposito (#7), Johnny Bucyk (#9), Milt Schmidt (#15), Terry O'Reilly (#24) and Ray Bourque (#77). "It was very special for me to be part of the Bruins organization," stated Cam. "I have great memories of being with an organization such as the Bruins that had great tradition and all these great players. Being able to retire as a Bruin means a great deal to me." Cam Neely is considered the pre-eminent power forward of his era. "I gave everything I could each shift," admitted Neely with pride. It was that dogged determination that set the competitor above his peers and earned him a spot in the Hockey Hall of Fame.